Cable Street in the East End of London was originally a long straight path adjacent to the River Thames and where ships’ cables (ropes) were twisted and laid out along. 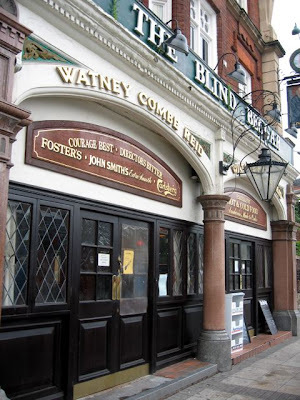 Fom Victorian times until the 1950s it was known for its brothels, pubs, cheap lodgings and opium dens – presumably because of the street’s proximity to London’s docks. 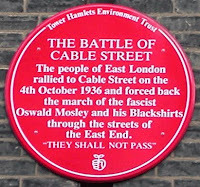 However it’s famous as the location of the street battle in 1936 between Oswald Moseley’s Blackshirts, thousands of anti-fascists (which included local jewish, socialist, Irish and Communist groups) and the Metropolitan Police who, in vain, tried to keep the warring parties apart. It ended up encapsulating the British fight against pre-war fascism – the political force that was marching across Europe in the mid-thirties – and realistically dealt the British fascist movement such a blow it never really recovered. 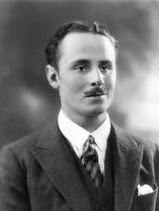 Sir Oswald Ernald Moseley came from an aristocratic Anglo-Irish family, and although infamous now for once leading the British Union Of Fascists before the second world war, he had a very strange and chequered political career. He was once, at the age of twenty-one in 1918, a Conservative MP for Harrow and actually parliament’s youngest sitting member of Parliament. In 1921 however, he left the Conservative party and ‘crossed the floor’ protesting about the use of the Black and Tans (a paramilitary force created by the British to target the Irish Republican Army but which became notorious for attacking the civilian population) over in Ireland. He became an independent MP but eventually joined the Labour party (he and his first wife Cynthia ironically were ardent Fabian socialists in the 1920s) and actually became a minister, albeit without portfolio, in Ramsay McDonald’s Labour government of 1929. His radical proposals to conquer unemployment were consistently turned down by the cabinet, and deeply upset about this, he resigned in 1931. After a tour of Europe he became enamoured with the ‘new movements’ of Mussolini and other fascists and formed the British Union Of Fascists (BUF) in 1932 which soon gained 50,000 members and the early support of both The Daily Mail and The Daily Mirror. The BUF’s meetings were provocatively racist and anti-semitic and the meetings, especially the huge rally in 1934 at Olympia, were ruthlessly stewarded by their black-shirted Defence Force. 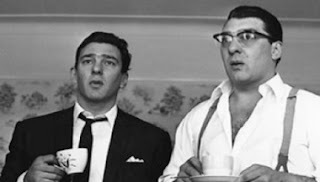 However, probably because of the BUF’s aristocratic and Tory sympathisers, the police were said to be strangely lenient. 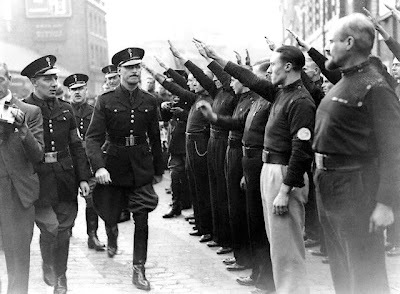 On the 4th October 1936 Oswald Mosley planned for thousands of his supporters to march into the East End of London, mainly because they wanted to antagonise the large Jewish population living there. The Conservative home secretary, despite the extreme likelihood of violence, refused to ban the march and its said that ten thousand police were mobilised to prevent the anti-fascists disrupting Moseley’s rally. However barricades and illegal roadblocks were erected around the area of Cable Street and which the police tried to take down. Running battles between the police and hundred of thousands of anti-fascists chanting the Spanish civil war slogan ‘No Pasaran’ ensued. There are stories of women emptying chamber pots on the police and the Blackshirts, and local children throwing marbles on the road and popping paper bags of pepper to disrupt the police-horses. Eventually the Police Commissioner demanded that Moseley called the rally off and the Blackshirts were eventually dispersed towards the West End and then Hyde Park. 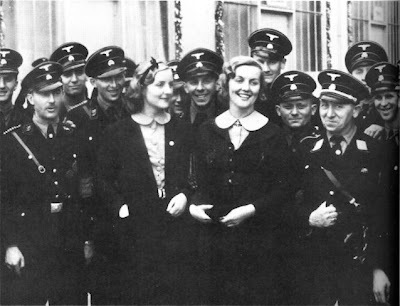 Oswald Moseley, meanwhile, had been having a long-running affair with the beautiful aristocratic Nazi-sympathiser Diana Mitford who had been introduced to Hitler by her sister Unity the year before. Both of the sisters had attended the Nazi Nuremberg rally earlier in the year and Hitler had actually provided a Mercedes-Benz to carry Diana to the Berlin Olympics. Adolf Hitler – his wedding present, by the way, was generously, a framed photograph of himself. Four years later in 1940 this very photograph was hastily stuffed under the mattress of her newly-born son Max when Diana was arrested, along with Oswald, as Nazi sympathisers. The Moseley’s, apparently at Winston Churchill’s behest, were interned in a little cottage within the confines of Holloway Prison in North London. Diana said that the best strawberries she ever tasted were grown by her in the cottage’s little garden. Max Moseley the son, by the way, is now the president of the very democratic (sort of) FIA which runs Formula One with Bernie Eccleston. Just a generation after the Battle of Cable Street a young American Jewish singer-songwriter called Paul Simon moved into the Cable Street house of Judith Piepe a big motherly German refugee who loved folk music and often put up homeless musicians. 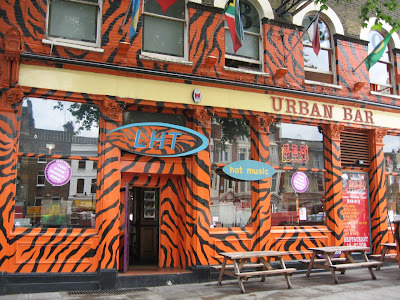 She specialised in the homeless – her shelter in the basement of St Anne’s church in Soho eventually became a homeless charity and was satirically called Centrepoint because the owners of the, then, new office block on the Charing Cross Road found it more cost-effective leaving it empty. She was a larger-than-life woman around whom, apparently, many legends accumulated, one of which was that she drove ambulances for the loyalists during the Spanish civil war (no doubt chanting No Pasaran whilst doing so). Paul and his English girlfriend Kathy lived with Judith in Cable Street for a short while in 1965. Paul had come over to England disappointed with the American public’s reaction to his and Garfunkel’s first LP Wednesday Morning, 3 A.M. released the year before. He played one night stands around Britain for most of that year and Judith heard him playing in The Flamingo club and persuaded him to appear on a regular spot on a religious BBC show she introduced called Five to Ten. Because of this he was offered a contract by CBS and he recorded The Paul Simon Songbook (originally only released in the UK), a one hour solo acoustic session of songs that became famous when re-recorded with Art Garfunkel. 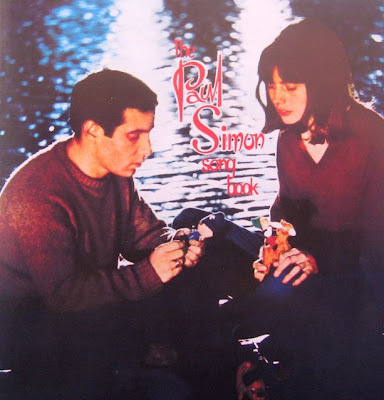 He met her in an Essex folk club (The Hermit Club in Brentwood and which incredibly still exists), where she was taking tickets at the door, and she soon became his muse at the time (that’s her on the cover of Paul Simon’s Songbook above – she was very pretty I’m sure you’ll agree). They parted when he went back to the US after the success of the folk-rock version of Sounds of Silence, and its said that she wanted no part in his new-found fame and success. She’s apparently a Grandmother now, with three children, and has lived in a small village in the Welsh mountains for most of her life. I personally think that Paul Simon has written some of the loveliest songs of the 2oth century and Kathy has been the inspiration of some of his best. Until early in the 19th century a person who had committed suicide was traditionally buried at a crossroads and with a stake hammered through the heart. Indeed it wasn’t until 1870 that suicide victims weren’t buried after nightfall. 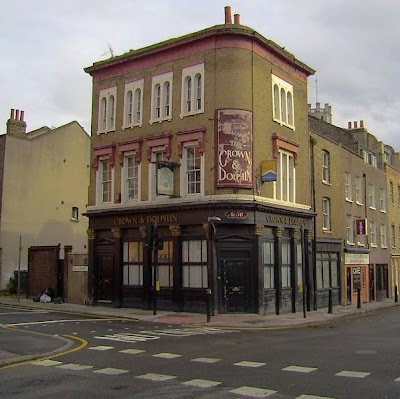 It is said that the last occasion that someone who had taken their own life and buried in such a way occurred in 1812, on the junction of Cannon Street Road and Cable Street. During the 1960s a new gas main was being laid along Cable Street and a skeleton was found buried upside down and with the remains of the wooden stake still where the heart would have been. It was the skeleton of John Williams, sometimes also known as John Murphy, who was almost certainly an Irish seaman. He was accused (probably wrongly) and arrested as a suspect of the infamous Ratcliff Highway (Ratcliff Highway these days is known just as The Highway and is and was a road parallel to Cable Street) Murders in 1812. He committed suicide using his scarf tied to a pipe in the Coldbath Fields prison, also known as the Clerkenwell Gaol. Taking one’s own life was seen as a such a sin in those days his body was dragged through the local streets, pausing at the scene of his supposed crime, and eventually thrown into a hole with a stake hammered through his heart. The stake was meant to keep the restless soul of a man who had ‘damned himself’ from wandering, and similarly, the crossroads were meant to confuse any evil ghost that may rise from the grave as to which direction to take.